Sonam rice, also called BPT Rice, can be identified by the short grains, the length usually being between 5.0 mm and 5.2 mm . Good quality rice has firm and intact grains- features prevalent in the Sonam rice (non-Basmati rice) we manufacture. The sweet taste and natural flavour of GOPAL brand Sonam rice will compel you to come back for seconds and thirds of your rice meal. As this parboiled rice has low moisture content, the grains do not stick or clamp together. The end product (Sonam rice) is good as the paddy we procure from various states like Bihar, Jharkhand, U.P. is of the best possible quality. The color of the rice can be processed as per the customer's requirement. 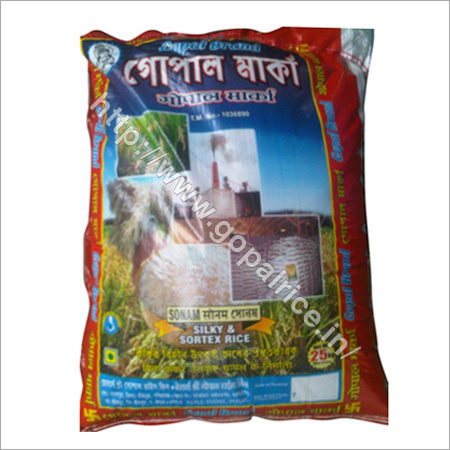 Sonam rice is available in 25 Kg and 50 Kg packet. And, when you pick a packet of your favourite GOPAL brand Sonam rice, you know you are making the right choice! Copyright © 2019-20 by SREE GOPAL RICE MILL All Rights Reserved.